In cities across the country, working and middle-class Americans are struggling to keep their homes, pay their rent, and fight off eviction and foreclosure. Somerville, Massachusetts has an acute case of a national dilemma—call it a case study in gentrification; Boston’s Brooklyn or the Oakland of Massachusetts. For a century and more, Somerville was a working-class neighborhood bordering Cambridge. The city is still populated with a dense mix of blue-collar workers and recent immigrants, all living in together in red-brick and clapboard three-decker housing. It also provided many affordable, off-campus rooms and apartments to Tufts, Harvard, and MIT students as well as artists, writers, and radicals. Today, it’s dealing with the aftershocks of a boom in biotech and the knowledge economy that’s now rippling out from post-rent-control Cambridge. That bloom of wealth and demand is pushing premium jobs and rocketing rents into neighboring Somerville, a place where suddenly everybody wants to live and a lot of proud residents can no longer afford. The Zillow real-estate listings tell the story well: A worker’s house with a postage-stamp garden on Fremont Ave, for example—sold for $65-thousand in 1995, now valued at $750,000, a 1000 percent gain over two decades, not untypical. 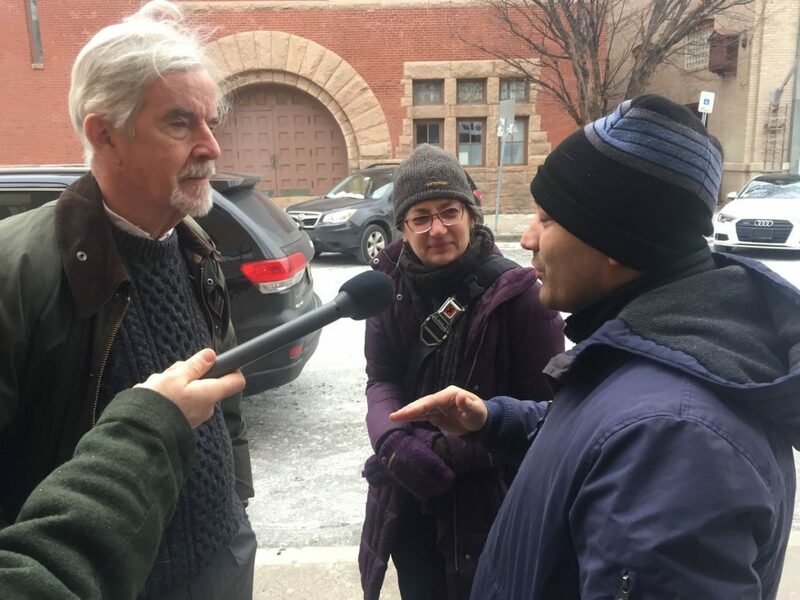 Many residents now are worried about further increases in rent as a result of the MBTA’s Green Line extension as well as a new, massive development plan proposed by the developer US2. The plan will include “1.38 million square feet of office, lab, retail, hotel, and arts space; and approximately 950 residences,” according to Curbed. But Somerville residents haven’t just been passive players in these changes. Today, they are ready to fight back against displacement and gentrification. Voters last fall elected a super-majority of progressives and skeptics to the Board of Aldermen, poised now for a vigorous re-think of the development questions. The focus is on Union Square where a big new transit station will center a cluster of lab and office space under a 23-story tower for high-end housing. We got the tour this week with Laurie Goldman, an urban policy professor who teaches at Tufts University, works with the Somerville Community Corporation, and also lives in Union Square. Laurie and other community organizers have pushed the city to increase inclusionary zoning and linkage fees as well as to establish an elected Neighborhood Council, which can negotiate a Community Benefits Agreement with developers in Union Square. Pictured with Laurie above is Ganesh Uprety, an immigrant from Nepal who moved his family to Somerville in the summer of 2015. He pays $2000 per month in rent for a 2-bedroom apartment and told us the expense leaves little for savings. To combat skyrocketing costs in his neighborhood, Uprety has attended meetings with Union United, a coalition of Union Square residents. 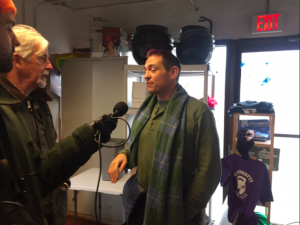 We also spoke with several other local residents affiliated with Union United, including Mary “Sugar” White, Ben Echevarría and Bill Cavellini for this week’s show. The Mayor of Somerville, Joseph A. Curtatone, joins us over the phone from Buffalo to give his perspective. He’s in his eighth two-year term as mayor and he’s still only 51 years old. J.T. Scott also gave us the Alderman’s angle from his CrossFit gym in Union Square. “The opportunity for us here is to restore a middle-class renaissance,” Scott said. He was elected to represent Ward 2 this past November, alongside a small army of progressive folks who now hold a supermajority on Somerville’s representative board. Steve Meacham is an organizer in the grassroots activist network for housing justice in Greater Boston, known as City Life/Vida Urbana. Before fighting against evictions across our city, Meacham was a union welder and labor organizer at the Quincy shipyards south of Boston.